And of course, on a day meant to celebrate the social, economic, cultural and political achievements of those who have been suppressed for centuries, there just have to be a few rotten apples that spoil the whole bunch. Presumably jealous they've never had to fight for the right to vote or demand equal pay, some men (and inexplicably, some women as well) have taken to social media today to express their utter disgust in the lack of an International Men's Day. Because equality. The only biggest problem with that logic is that there is an International Men's Day. And a quick Google search reveals the date in question to be November 19. In the face of this Twitter uproar, one Dark Knight has risen on social media to reassure the "menists" that there is, in fact, also a day that's certifiably all about them. 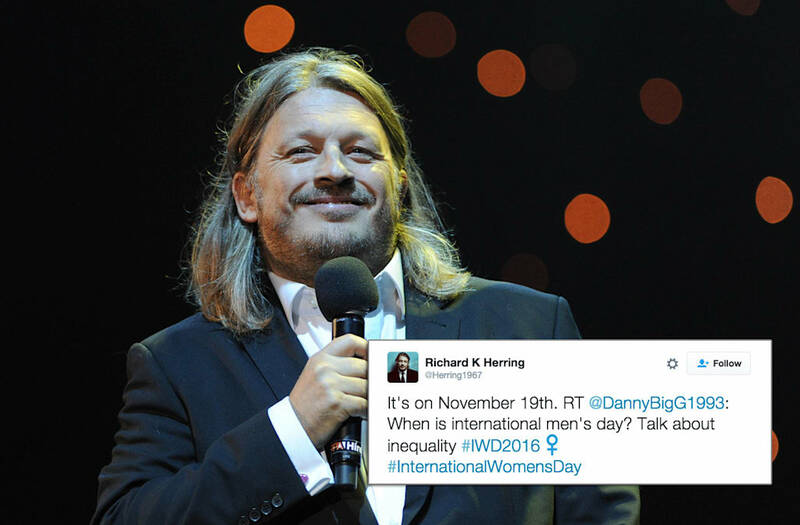 Comedian Richard K. Herring has dedicated his entire March 8 to informing the misinformed, who are simply unable to comprehend the idea that dedicating one day to celebrating the accomplishments of women does not in any way take away from the accomplishments of men. And thus far, it has been glorious. There is, Nov 19, no one cares RT @Pr1n_cess: If there were an international men's day all females would be losing it.. There is. Nov 19 RT @dylankeith__: ok so if feminism is all about equality how come there's not an international men's day? I think America has just woken up. But seriously, all they had to do was Google and this entire thing could've been avoided. Maybe use a 21st C search engine. Nov 19 RT @greencalx: searched Alta-vista for International Mens day+got nothing. How's that 4 equality?!! As more of the world wakes up, it should be interesting to see how long Mr. Herring can keep up his trolling. Though someone else may soon have to pick up the torch -- it seems our friend is growing tired. I am so tired. I've been doing this since 6am. Let me sleep idiots. So shines a bright deed in a weary world. We applaud you, Richard.